Woman's suffrage advocates. Lucy Brown Johnston - Born: April 7, 1846, Camden, Ohio. Died: February 17, 1937. William Agnew Johnston - Born: July 24, 1848, Ontario, Canada. Died: January 23, 1937, Topeka, Kansas. On November 5, 1912, the Woman's Suffrage Amendment to the Kansas Constitution was ratified by the voters of the state by a majority of more than 160, 000 votes, making Kansas the seventh state to enfranchise women. A primary reason for this success was the efficient organization and leadership provided throughout the campaign by the Kansas Equal Suffrage Association and the Men's Equal Suffrage League of Kansas. Two individuals of great importance to each of these organizations were Lucy Browne Johnston and her husband, Chief Justice William Agnew Johnston. Throughout their 62 years of marriage the Johnston's held most of the same values. Both were conservatives with loyalties to the Republican Party and they agreed on such social issues as opposing capital punishment, and supporting prohibition and women's suffrage. A spirited political and social activist, Lucy Johnston began her "active" work in the Kansas Equal Suffrage Association in 1910, when she was appointed to a legislative committee assigned to cultivate support for the Suffrage Amendment in the Kansas Legislature. In May 1911 her duties increased when she was elected president of the association and was saddled with running the ratification campaign. She saw to it that more than 90 percent of the state was organized into workable districts. Through this network literature was distributed across the state, which countered the anti-amendment league's contentions that women were not concerned or intelligent enough to vote responsibly. President Johnston also instructed the speakers representing the association to seek out audiences at chautauquas, fairs, picnics, and other social events instead of waiting for audiences to come to them. All of these tactics maximized the effect of the limited campaign funds at the association's disposal. As a result of this lack of funding the association needed additional support to reach some of the male voters. The Men's Equal Suffrage League provided this assistance and more. One of the earliest members of the league was Chief Justice Johnston. 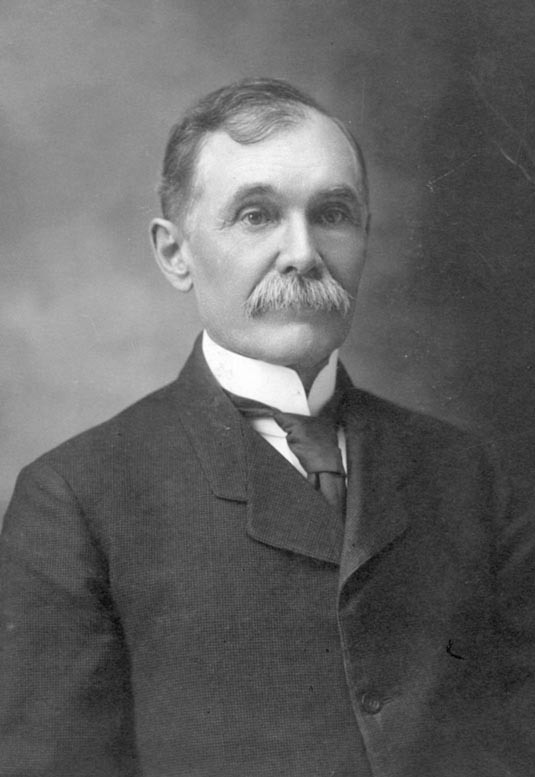 As of 1912, he had been a member of the Supreme Court for 28 years, the last nine as chief justice. His position of respect made him and others like him, valuable assets by adding prestige and notoriety to the campaign. 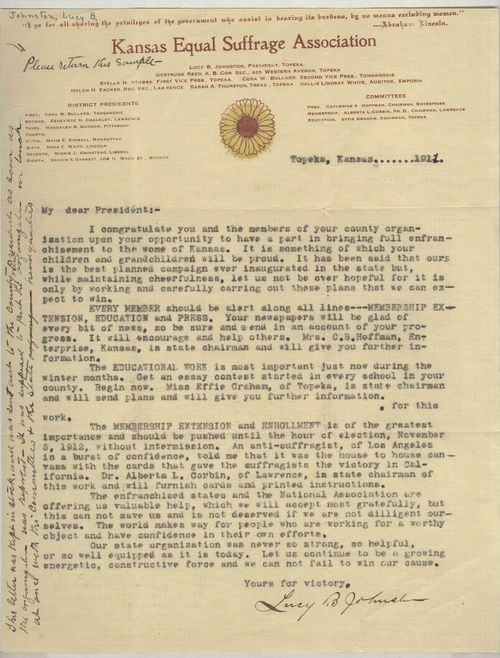 The league also did a great deal of canvassing of the state at no charge to the Kansas Equal Suffrage Association, which included giving addresses to groups closed to women at Masonic Lodges, Old Settlers Meetings, Odd Fellows Halls, and other fraternal organizations. It was not the sole efforts of the Johnstons that made the ratification of the Equal Suffrage Amendment a reality in Kansas, but a number of men and women like them that were devoted to the ideal of equal suffrage for all citizens.